How To Better Manage Time On A Day Like This? 04 Jul How To Better Manage Time On A Day Like This? Time is precious. But seriously, how precious? To find out, here’s putting time into perspective (literally) in a 24-hour block. Depicting a typical work day of an office worker (no OT! 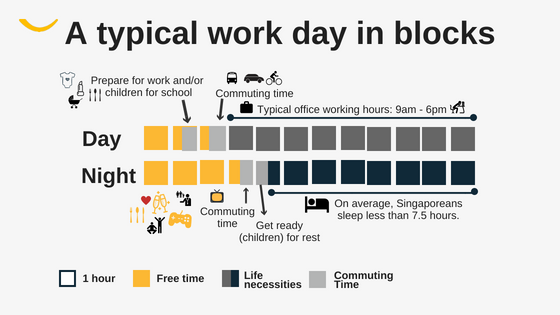 ), the yellow little blocks signify the free time that one gets aside from time allocated for commute, work and sleep. 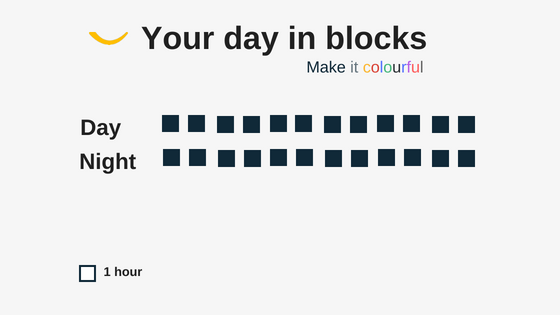 How would your day in blocks look like? We always hear loved ones and friends lamenting, “Not enough time”, “I’m so busy”, and perhaps we are the ones who have been saying that too often. Well, if you find that you are always running late or out of time, it may do you good to 1) put time into perspective by colouring the above blocks, 2) practise good time management skills with simple tools, 3) be disciplined and persevere with your goal to make better use of time. It is a wonderful world, and the (distracting) wonders never stop – which explains our quickly depleting attention span. Getting organised is one of the keys to better manage time, and you can do so by keeping a to-do list with an achievable timeline. To make things easier, try using mobile apps such as Evernote or Trello for all your personal and professional projects. If 24 blocks in a day is not enough, how about breaking it further into 48 blocks? Ever wondered what can be done in 30 minutes? You can get a power nap – according to a 2016 global study on normal sleep schedules (by smartphone app Entrain), Singaporeans sleep less than 7.5 hours per day. To further rejuvenate, there are express facials that take only a half hour or you can literally smash your way through a rage room for instant stress relief. In fact, time is so precious that Etiqa is offering 30-minute Fast Motor Claims Approval – a first-in-market motor insurance feature. Did time slipped by without your notice? Trust us, it happens all the time. If you have created your to-do list and need to focus on the tasks at hand, these mobile apps can help: focus@will has over 20 channels, with tens of thousands of… … music for productivity! If that doesn’t help, Forest will definitely do the job by keeping you off your phone. Here’s how it works: After you have planted a seed, it will grow into a tree as time goes by, but if you cannot resist using your phone, your tree will wither. Last but not least, it’s time to acknowledge that ‘no man is an island’ and superheroes in real life have limitations. If you have too much on your plate, why not ask for help or delegate the tasks? You do not need to do it all. With TimeTree mobile app, you can share a calendar with your family, friends and/or co-workers, and share notes or even set reminders. You can sync the TimeTree calendar with other calendars such as Outlook, Google, Apple, etc. too.